1. The food is out of this world. Disney’s Art of Animation’s (DAA) restaurant, Landscape of Flavors, is set up cafeteria style. You grab your tray, and head to different stations to build your meal. The build your own burgers, pasta and omelettes and unreal. 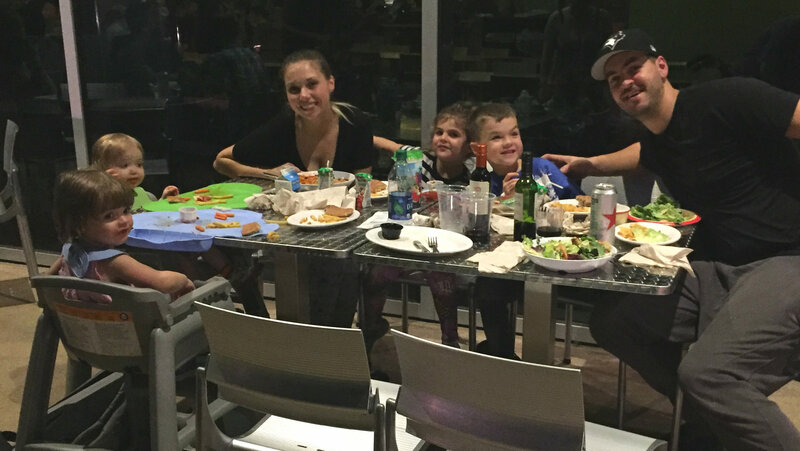 This dining option works well with kids too. You can sit inside, outside, or even take your meals to go up to your room. 2. You feel like you are inside several Disney movies. 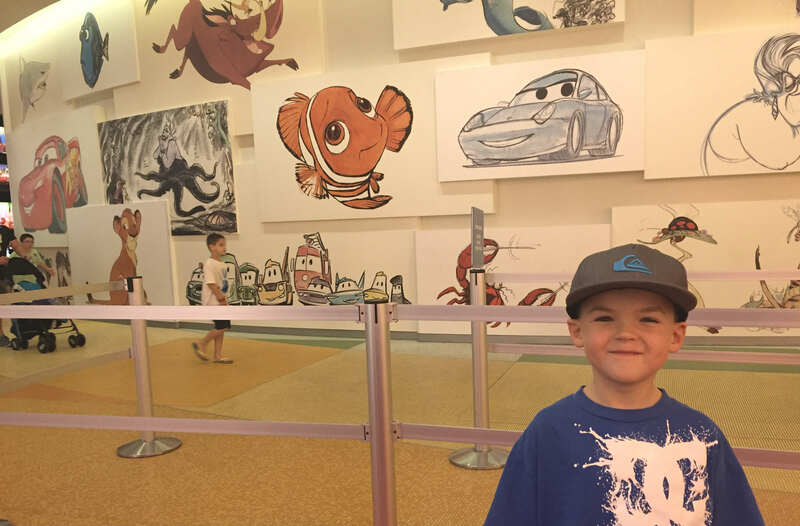 Our family stayed in a Cars suite, which was on one end of the resort and my parents stayed in a Little Mermaid room on the other side. To walk from one end to the other, it takes about ten minutes. 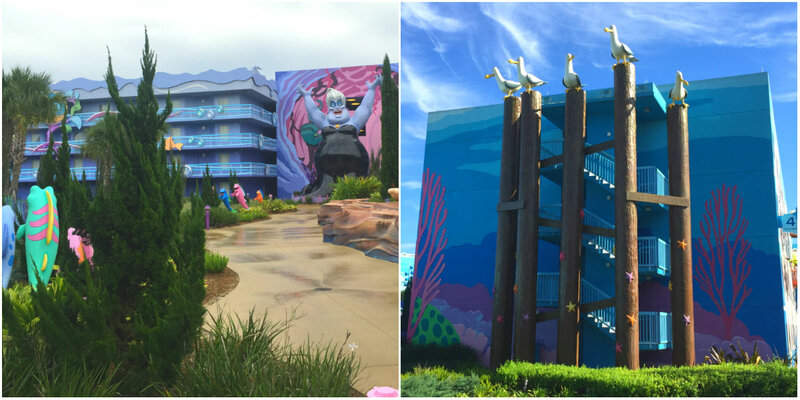 Throughout the entire resort, there are groupings of buildings that are themed differently: Cars, Little Mermaid, Lion King and Finding Nemo. There are whimsical characters scattered around the resort that were perfect for photos and climbing. You truly feel like you are inside Disney movies. 3. The best pool for young kids. 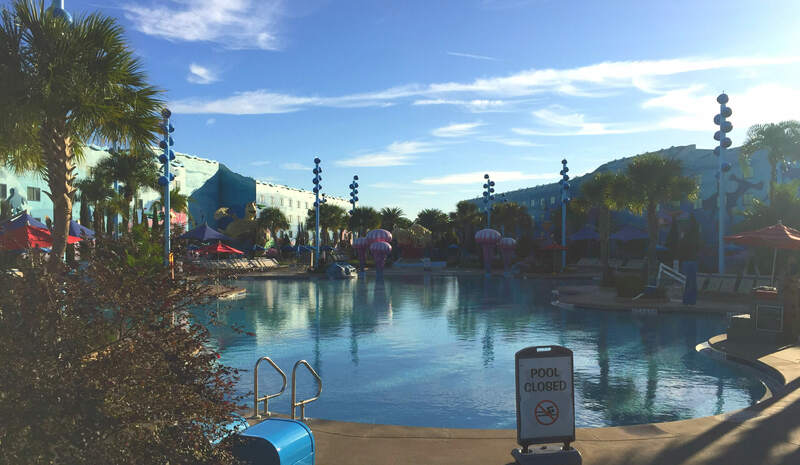 The Big Blue Pool, which is Finding Nemo themed, is the biggest pool in Disney World. But what made this pool extra special for us was the gradual entry. This meant that our older kids could swim around (with floatation devices) while our twin toddlers could run in and out of the pool while my husband Mike, and I supervised them. 4. It doesn’t matter if your kid is melting down. There is constant action and music going on around DAA, especially in the restaurant. This is perfect for kids ages 0 – 10. 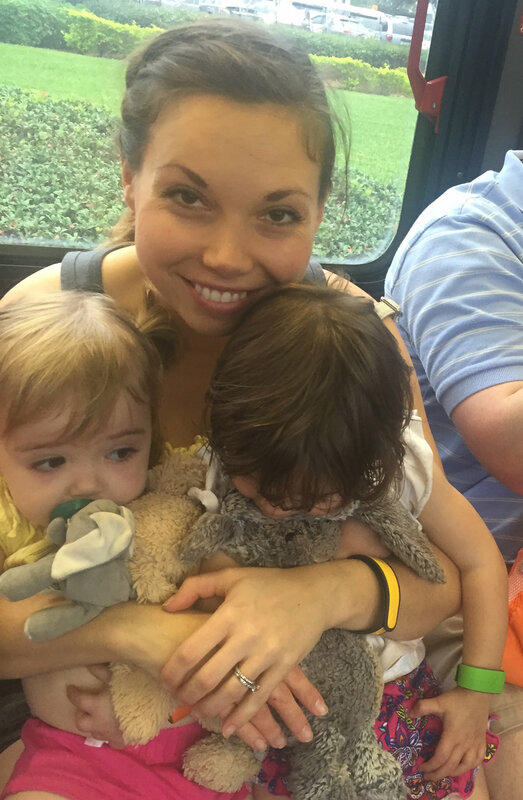 Visiting the parks is exhausting, especially for young kids. So it is understandable that your little one might have a little meltdown by dinnertime. But between the music drowning them out and looking around the room and seeing all of the other exhausted kids, it really doesn’t matter. 5. The rooms are baby-proofed. 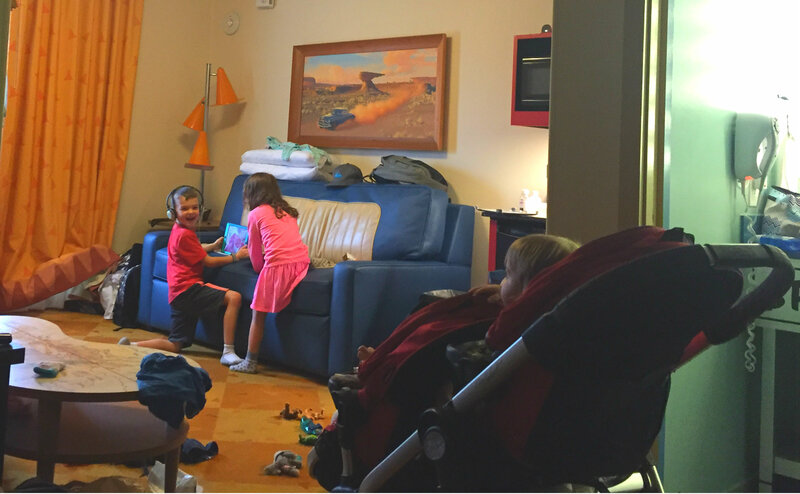 Unlike the second location we stayed in in Florida (and had to spend the first day baby proofing), our kids were able to go straight in and enjoy the entire space without Mike and I having to chase them around and set limits. The space isn’t huge, so there wasn’t anyway we could start closing off areas. Tip: We rented cribs ahead of time from Kingdom Strollers. They were at the front desk waiting for us when we arrived. 6. It’s stroller friendly. As a twin mom, I am heavily reliant on our double stroller. DAA had beautiful wide paths, elevators and lots of space in the dining area and pool area to accommodate our stroller. We would even use it inside our room to contain our busy toddlers while they had a snack and we could get ready to head out the door. 7. There is always something to do. Aside from the pools, there is also a playground, a Lion King bones play area, evening outdoor movies and so much more. We spent a lot of our free time playing in the Lion King bone area, because our twins and older kids could safely run around and burn off energy. 8. Taking the buses to the parks is so convenient. We loved that we could take shuttle buses to and from the Disney parks whenever we wanted. This especially came in handy when we had to shuffle our kids around one day. Tip: If you are going to bring a stroller, bring a folding stroller. Our double stroller which has to be taken apart when you fold it up became an ordeal each time we got on the bus. Between juggling twins and two older kids, it was pretty tricky. Lesson learned. 9. The attention to detail is memorizing. I think this was my favourite part about DAA. I was constantly trying to take in every detail, from the plants shaped like coral to the patterns on the bedding. Even my four year old daughter would pick out light fixtures that looked like cones in the Cars building. Bravo Disney, bravo. 10. It makes you feel like a kid again. 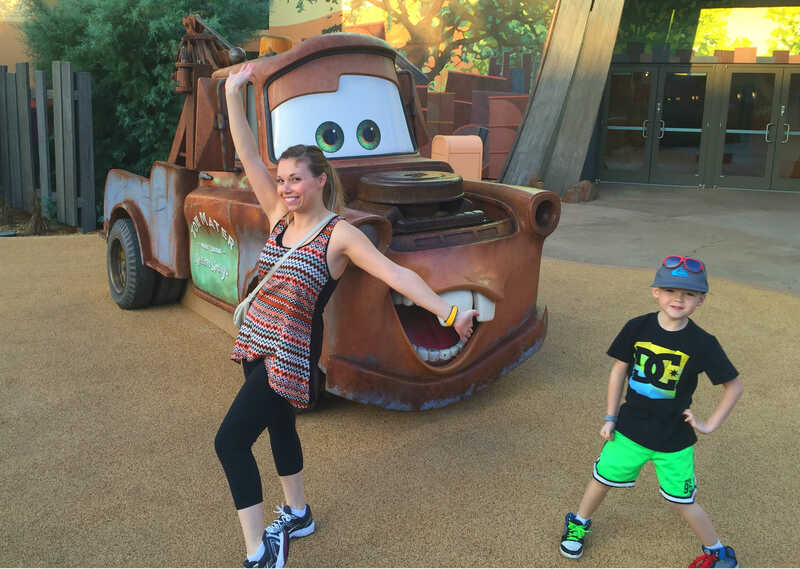 I tend to have my “mom hat” on too much, and forget to let loose and be silly with my kids. But there was something about seeing all of those characters from the Lion King and Little Mermaid that brought me back to my childhood. I may have even let loose a little. 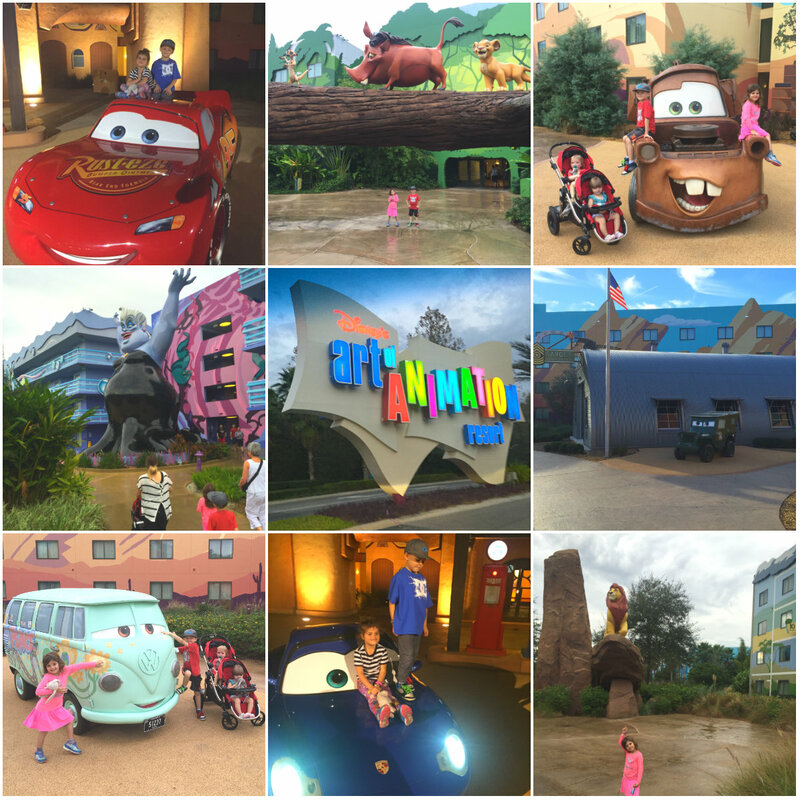 Don’t forget to read all about our drive to Florida, our Bibbidi Bobbed Boutique, Hollywood Studios and Magic Kingdom experiences!